In a brief moment of respite, I stopped the the work van, a recently discontinued Dodge Caravan, and idled behind a small compact car. I sat there with a weight on my chest, my first break seemingly in a week, my work anthem playing in the background as I read a slogan on the back of the compact ahead of me in line to the next red light. The owner of this car was either very uncertain of his convictions, or was so sure of the resale value of his import, that instead of sticking the stickers on the bumper of the car, they were scotch-taped to the rear window. On the left side of the window was a sticker-length version of a memorable Albert Einstein quote, written specifically about politicians. 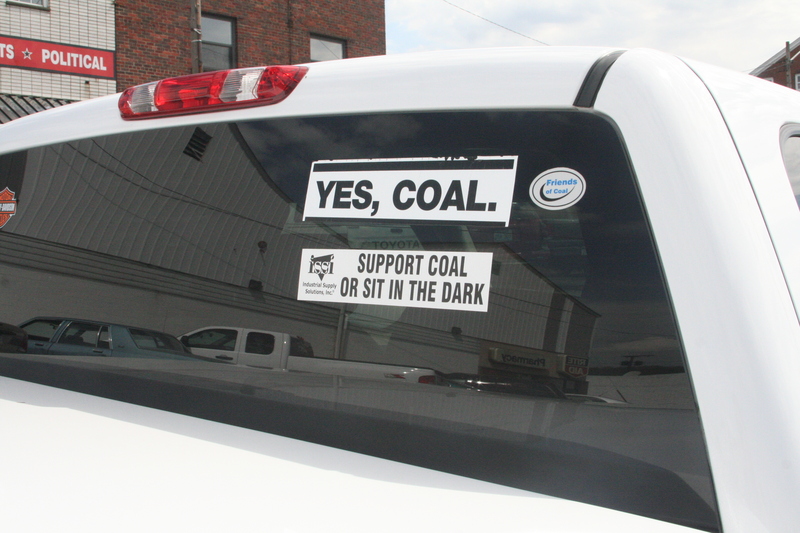 The right ‘window sticker’ was probably a vote of support for solar power, or unions, or The Brotherhood of Solar Panel Installers Local 179. Sitting sweaty in the van, I applauded his uncertain efforts. Grandma gave me a calendar for Christmas. It was a monthly wall calendar for 2014 which she thought held daily thoughts and inspirations for someone like myself; a person with flagrant internal rage and one of those websites that a person can say whatever they want to inflate their self-worth. She wanted to give me ammunition to write more often and write about things that mattered. The calendar, it turned out, only had one piece of knowledge per month often no greater than, ‘When I am sad, I dream about owning a million pairs of shoes’. I told Grandma that the calendar unfortunately didn’t have daily advice, only monthly, and shortly thereafter came a box came in the mail with a new calendar—a daily flip calendar with real thoughts that transcended the very real epidemic of retail therapy. On March 24, the uncertain bumper/window sticker reappeared. In Saskatchewan, social change generally means the grand opening of a new tavern or the retirement of a washed up wide receiver in the CFL. Students greet tuition hikes with annoyed tweets, and any sort of popular movement gets propagandized to become the ire of the middle class. Fear-mongering using the threat of economics convinces the friendly neighbour to become selfish, survivalist, and hateful. Bumper stickers and social media are considered a form of real protest and social involvement. A friend recently arranged a community art exhibit entitled ‘Hands’. The exhibit encouraged a discussion of Missing and Murdered Indigenous Women in Canada aimed at discouraging victim blaming in both conversation and in the media’s portrayals of the violence, and to focus on the perpetuators of the violence, not particularly on individual levels, but rather on a larger societal level. She greatly succeeded in allowing those with the luxury of purposeful indifference to participate in the greater discussion of which they may not have otherwise been a part. She succeeded in partially shifting the obligation of the solution from the perpetuator to the people. Calling on the federal government and RCMP to conduct a public inquiry, which is a common and ongoing demand of this movement, is asking the perpetuators of the gender violence to either point fingers at individual abusers and victims, or to give reasons and excuses for their long-lasting colonial violence. In doing this, nothing will be solved because people with the same level of thinking will be at the helm. The responsibility of finding a solution needs to be transferred from the policy-makers to the people. The gender violence that is a part of Canada’s history with colonialism cannot be solved by perpetuators of colonialism. Real social change will occur, as Hedges states, “among the poor, the homeless, the working class, and the destitute. By asking the perpetuators to solve the problems which they themselves created, we hand the wheel of a fast moving car to a driver unwilling to keep their eyes open. If we do that, not only will bumper sticker protests be too smashed up and damaged to be read, but calendars will no longer be a place for profound thought, but only a place to count the days between abominable genocidal events. Change can begin with personal investment in the gaining and sharing of new knowledge and an independence from oppressive arms of the state. In such ways, communities and movements are formed.